Recently, I interviewed Ethan Persoff, the Austin-based archivist of dirty comics and other strange ephemera. I didn't have room for all of Ethan's offerings, so I'm running this bonus post, which features one of Ethan's comics on feminine hygiene products. 1) HOOKED! Heroin Abuse Comic - The main reason I'm fond of this thing is art from it has been identified as being used in the Principia Discordia. So, in a way, HOOKED! is sort of an absurdist's religious relic. To quote Robert Anton Wilson, we are all Popes. But it's also a powerful story about heroin abuse, drug overdose, prostitution, betrayal, and death. 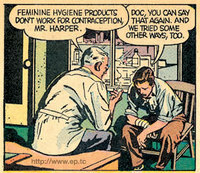 I love that it was distributed at methadone clinics, too. The idea of getting a government booklet with your dope is pretty funny. And check out how you can identify dope addicts by the change in their skin color from normal (non-using) to yellow (using). That color technique is something usually only found in purposefully artful comics, and only recently at that, certainly not in any comic forty years old like this one. 2) STOP THE MADNESS Music Video - This isn't a printed item, but it matters to me because I not only proved it really existed, but also found a broadcast master copy. Acquisition is its own good story: Came from an old UHF station, who accepted a bottle of vodka for the item in exchange. So I traded alcohol for an anti-drug music video. This thing has long been suppressed by everyone involved, and when it showed up on the website it literally went around the planet immediately. VH-1 just included the video in their recent piece on cocaine and drugs in the 80s. They'd never referred to the video in previous specials and I know it was my posting this item that brought it back to life, culturally speaking. So that felt gratifying. 3) 1949 CHILDREN'S HOSPITAL FUNDRAISING COMIC STRIPS This one is probably the most unusual thing on the whole site. It's a complete set of eight comic strips about children with cancer, mental retardation, polio, low birthweight, bad blood, facial deformities, head trauma and speech impediments. From 1949. Used in door-to-door Christmas Season fundraising efforts for the Children's Medical Center in Boston, MA. If unusual head-bending comics are your taste, these things are rare gourmet eating. Re: Stop the madness video. Why do you think it was repressed? Was it regarded as too heavy handed, or unhip? Obviously a bit of money went into it, and quite a few names were were invovled, some of who went on to ther own rehabs and convictions. I'm just wondering about the back story to the "making of" aspect. And thanks for giving a bottle for the cause of artistic preservation!